Once upon a time I had to downgrade an image quality to make sure this blog wouldn't get shut down because of too much bandwidth use. The internet was old and creepy in those days. The sad thing is I don't have a decent image anymore. Maybe on an old hard drive. It's a joke that can't even be explained anymore. The original thing it was working from was actually quite sad. A little girl (I think? 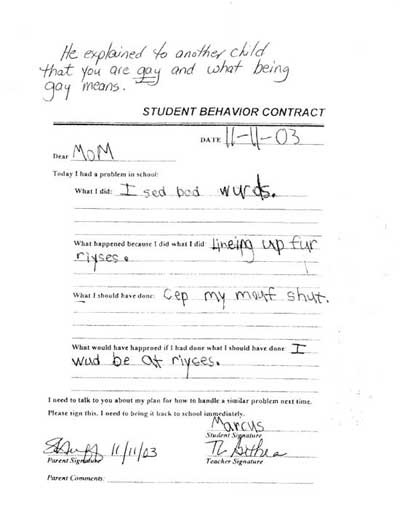 Might have been a boy) said her mom was a lesbian in school and her teacher made her promise not to say it anymore. The ACLU filed suit. "Cep my mouf shut" is from the original. ...commenter rhymes with mofo provides the original. The student was (apparently) a boy, Marcus.